Previous posts have described how mechanical recordings were made and played, and how I myself owned a hand-cranked Victrola when I was a kid in Vermont. 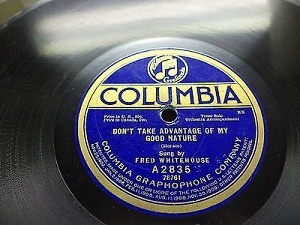 In today's post I'd like to reminisce about some of my favorite 78 rpm records. So that you can enjoy these, too, I am going to include links to MP3s (or, in a couple of cases, MIDI files). In most cases, the MP3 was made from the original record, following the laws in effect when they were pressed. In other words, listen and enjoy but you may not use these recordings for commercial purposes. Prior to moving to Vermont, my Dad, a true music lover, had always made sure I had a working phonograph and a supply of records to play on it. One time, exploring the house in that way only a six-year-old can do, I discovered a stash of 78s in his bottom dresser drawer. I was very excited, but he told me he intended to dole them out a few at a time, to make sure I wasn't overwhelmed with too many new songs at once. To ease my disappointment, he gave me the album at the top: Act 1 of Verde's Aida. Was opera too heavy for a six year old? No one had told me it should be, and I played all ten 16-inch disks, one after the other. Some of the slower arias I found boring; and, of course, I couldn't understand any of the words, which were in Italian. But I didn't care. All the labels to the songs were also in Italian, but I memorized my favorite pieces by the pattern of the words and also the pattern of the grooves on the record side. My very favorite? As it turns out, it's the same as everyone's: The Grand March. Large-scale pieces, such as operas and symphonies, were in those days released as true albums, that is, analogous to photo albums in that they consisted of a number of "pages" (called sleeves) bound together between a sturdy cover. 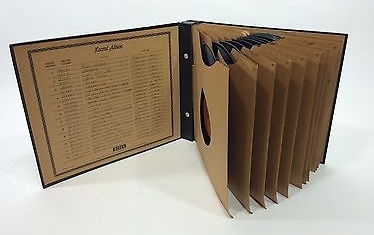 Each sleeve held one disk; typical albums consisted of from three to ten disks. Classical music was usually recorded onto 12-inch disks; popular tunes were usually on 10" disks. Children's songs were sometimes on 7-inch disks. The smaller the disk, the shorter the available playing time, of course. Other classical pieces I had included Wagner's Ride of The Valkyries (which I loved) and Tchaikovsky's Nutcracker Suite, which I didn't know was associated with Christmas and so played all the time. I remember when I was kept home from school with the chicken pox, for some reason Nutcracker's "Arabian Dance" was soothing to me, and I played it over and over. Another favorite was the Golden Records' recording of Little Toot, about a mischievous tugboat who "came from a line of tugboats fine and brave" but nevertheless didn't "give a hoot." I cherished that record and was happy when I played it (now in MP3 format) to my then-three-year-old grandson, Zachary. It likewise became his favorite song, until it was eventually replaced by the works of 50 Cent. In addition to providing recordings for youngsters, Golden Records sold "covers" of hit songs. These were sound-alike copies of top ten tunes, sung by someone other than the original artist and costing a fraction of the cost of the actual hit (not that any records were very expensive in those days). Therefore, I had Golden Records rip-offs of The Banana Boat Song, Green Door, and Blueberry Hill. That latter was my Dad's favorite song, and when we discovered blueberries growing all over the property in Vermont, he promptly named the place "Blueberry Hill." There was also a record, whose title and artist I have forgotten, but that nevertheless sticks in my mind. The singer was a little boy with an unusually sophisticated voice, who was apparently being marketed as a new, male, Shirley Temple; both songs on the disk were tear-jerkers, one in which the boy prays to God to revive his dead puppy, the other in which he urges his parents not to break up. Of course, at six I didn't really know what he was singing about; but I found his voice to be a little creepy. To walk the righteous way. That he'd make one of his own. That's how Adolf was born. And put mankind in its place! For to kick that Russian bear. Tooth and claw, day and night. Don't hit that Russian bear! 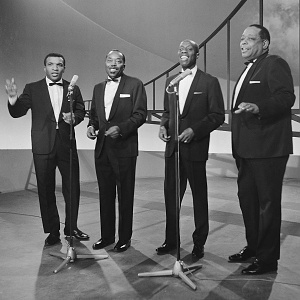 The song had been recorded by the Golden Gate Quartet in 1943. By 1963, when I was old enough to understand that the Cold War meant we were supposed to hate the Russians, I couldn't help but note that just two decades earlier, the Russians had been on our side and celebrated as heroes in popular music. Another bit of trivia I picked up from that record was the fact that it was produced by Okeh Records. I had picked up my first information regarding record publishing and the companies that do it from my Dad, by asking about record labels. I recognized RCA Victor and Columbia and Decca and Mercury, and had even learned that the " Bluebird" label was a subsidiary of RCA and what that meant. Okeh was a new one on me, so Dad had to explain that they were a special label for black performers. The information was presented neutrally. I already knew that Victor Red Seal was a special label for classical music; so the idea of special labels for various classifications didn't seem that unreasonable to me. If he'd told me there was a special label for blondes or for songs whose titles began with the letter 'S' I wouldn't have had any more trouble accepting it. Okeh's history is actually more intricate than Dad knew. 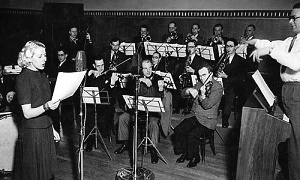 In the 1910s they specialized in all kinds of music that wasn't part of the mainstream, including Polish and Yiddish recordings. But a 1920 recording by blues singer Bessie Smith was a surprise smash for the label, revealing the huge untapped potential of the African-American market—both for performers and aficionados. So by the 1940s they did, indeed, specialize in what they called "Race" music. When we moved to Vermont in 1958, knowing there would be no electricity at our new township, Dad bought me a beautiful upright, hand-cranked Victrola—and, best of all, a whole ice chest full of records to play on it! (You can see the ice chest in the photo, at the lower right.) He haunted second-hand stores and auctions, and probably had purchased the two items together. Not that used 78s were hard to get in those days, but in this case the treasure turned out to be the range of music in that chest; for the disks went all the way back to the second decade of the century, as old as a record could be and still be a disk (rather than a cylinder). I spent many, many hours in that attic with my Victrola, sometimes reading while a record played; more often singing along with it, even though I had no idea what most of the songs actually meant. And we can wicki wicki wacki woo! So hello, aloha, how are you? The challenge to me was that I had no idea what a ukulele was, or Hawaii either—this was before it became a state. So Mom had to explain both to me; and thus the next year, when Hawaii did become a state, I was the only kid in my class who had heard of it, as well as being able to locate it on a map. They'd bring her home, but never again! She'd always say "No listen, Dear,"
You can drive me anywhere, And I won't care. Because I'm always willing For anything that's thrilling! I may even give you two or three or four! I've got out and walked before! Patti Page recorded and released this beautiful song about a woman who loses her to love to a friend on the dance floor, in 1950. It was her biggest hit. She re-recorded the piece a half-dozen times in stereo and with an "updated" arrangement, but the first is still the best. 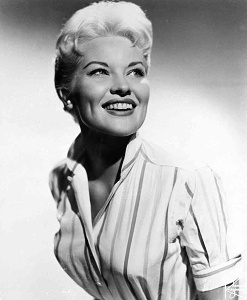 By the way, Patti Page was the very first artist to use the recording technique called "overdubbing," in which the same singer records multiple parts which are played back together, making the singer sound like a duet (Page's song Confess) or even a quartet (With My Eyes Wide Open, I'm Dreaming). This technique was probably brought to its highest level by Enya (99 voices), and today is quite common—I've used it myself. 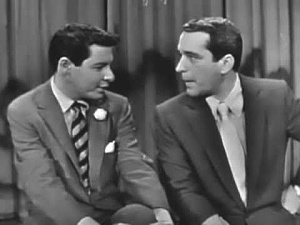 This ultra-smooth duet between Perry Como and Eddie Fischer, a light-hearted paean to summer, was my introduction to the vocal style known as "crooning." Although this duet was hardly Como's first hit, or biggest, it was my introduction to the singer. Later, while spending the winter in Val's Motel in Concord, I heard Catch A Falling Star on the jukebox and was hooked. While Como was easy to satirize—I have a friend who calls him "Perry Coma"—the fact is that Como was able to make the extremely difficult task of interpreting a song so that the song, and not the performer, is the star—seem so easy that he barely even seemed to be present. His lack of ego was evident in his personal life, as well. (He was married to one woman, a girl he'd met when he was 16, until her death when he was 84.) Lack of ego is a lesson I need to work on; but at least Como is an example I can try to follow. And sorta, kinda, hand her the ring? Though Como's and Fisher's vocal styles (crooning) are so similar they sound like brothers (or even the same singer overdubbed) when harmonizing, their personal lives couldn't be more different. While Como was married just once, Fisher was married five times, each to one of the world's most beautiful women: Debbie Reynolds (married 1955-divorced 1959), Elizabeth Taylor (married 1959-divorced 1964), Connie Stevens (married 1967-divorced 1969), Terry Richard (married 1975- divorced 1976) and Betty Lin (married 1993). Betty Lin died on April 15, 2001. Fisher is the father of two children by Reynolds, actress Carrie Fisher and Todd Fisher, and the father of two children by Stevens, actress Joely Fisher and actress Tricia Leigh Fisher. Fisher's two autobiographies barely mention his singing career; one wonders that he had any energy left to sing at all! Although it was 1958 when I got this record, it was released in 1951. A subsequent hit for Bennett was Stranger in Paradise, which I had heard and fallen in love with on a jukebox at a bowling alley my parents frequented. It was my favorite song there, and was the first cover song I envisioned when planning my own album. 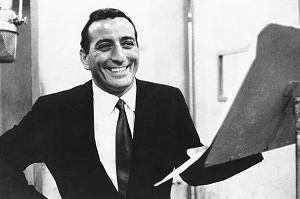 Incidentally, Tony Bennett was one of the first celebrities to work for an end to racial discrimination. In fact, he began resisting this while he was still in the Army at the close of World War II. That alone would make him one of my heroes. I guess my point is how potent can be the music one listens to when growing up. Folks generally think the music of one's teenage years is what stays with a person, but I think I present an example of how important the music one hears at the earliest years—and especially 7, 8 and 9 years old—is equally if not more important in shaping the character and musical tastes of a lifetime. Maybe I'd better start guiding my grandson Zachary away from 50 Cent.